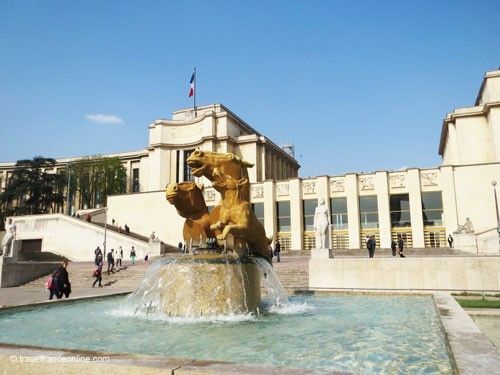 The architects Boileau, Carlu et Azema designs the Palais de Chaillot in the late 1930's. 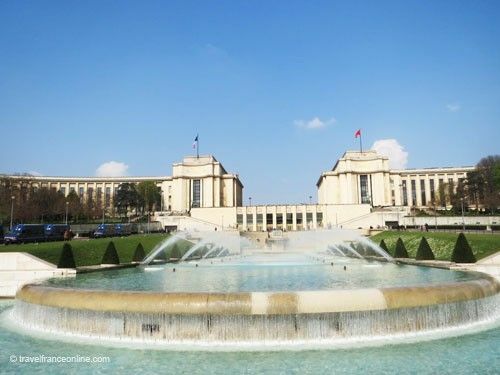 The Art Deco building consists of two semi-circular wings that frame a vast terrace, the Esplanade des Droits de l'Homme, and overlook a public garden (Jardins du Trocadéro) that stretches down to the river Seine. This terrace boasts prime views of the Eiffel Tower and the Rive Gauche. 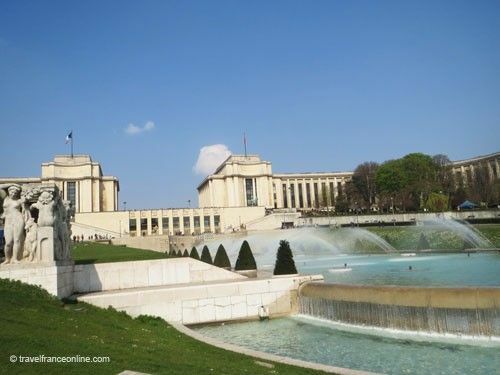 The Esplanade des Droits de l'Homme commemorates the Universal Declaration of Human Rights; the General Assembly of the United Nations indeed adopted the bill in the Palais de Chaillot on December 10, 1948. Impressive sculptures that symbolise Human Rights, La Pensée by Delamarre and Les Éléments by Carlo Sarrabezolles, adorn this terrace. 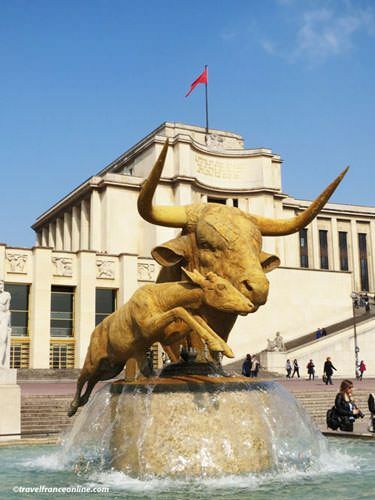 You'll also find two impressive bronze statues, Hercules subduing the Cretan bull by Albert Pommier and Apollomusagète by Henri Bouchard in front of the wings, whose pediments are adorned with verses by the French poet Paul Valery. The south wing houses the Musée National de la Marine and the Musée de l'Homme (ethnology). 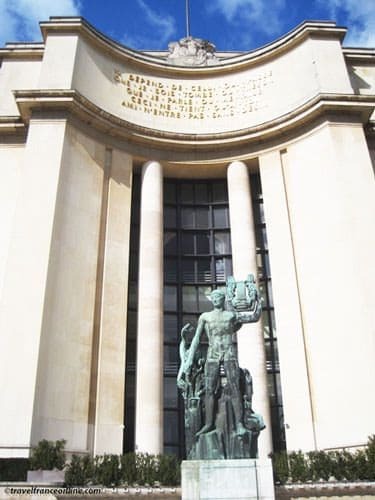 The east wing is home to the Cité de l'Architecture et du Patrimoine, the Musée des Monuments Français and Théâtre National de Chaillot. 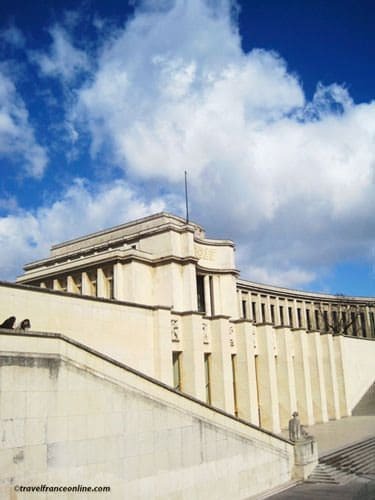 The Palais de Chaillot replaces the Palais du Trocadéro. The name of this Moorish palace, designed by the architect Davioud for the exhibition of 1878, commemorated the seizure of the Andalusia fortress in the Bay of Cadiz. It served as a venue for international summits until the International Exhibition of Arts and Technique in Modern Life of 1937. 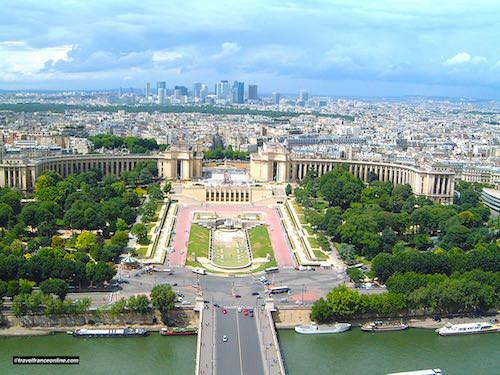 The Esplanade of the Palais de Chaillot boasts prime views of Paris and is one of Paris' most popular tourist spots. However, the hill known as Colline de Chaillot, used to be much higher until the early 19th century, when Napoleon levelled it to build a palace for his son. His project never went through as he was booted out of power! The hill was eventually landscaped, decades later, on the occasion of the Universal Exhibition of 1867. It remained rural until then and was part of Nimio, a community that regrouped several tiny settlements and stretched from the Seine to the current Place Charles de Gaulle-Etoile. Nimio eventually split in two major settlements in the 15th century. Autolium became Auteuil and Calcium became Chaillot. Calcium (which evolved in Chaillot) spread on the stony north facing hillside (hence its name) among vineyards, gardens and fields. The rural village of Chaillot became a borough of Paris in 1659 and a district in 1787. It became also known as Faubourg de la Conférence, because the Porte de la Conférence, the toll gate of the Mur des Fermiers Généraux stood in the village. Away from the city, yet close enough, it became a sought after area. Several abbeys and monasteries were built and thrived until the French Revolution. No vestige of this long gone era has survived, however, the hill has been transformed from a stony land into an elegant public garden. 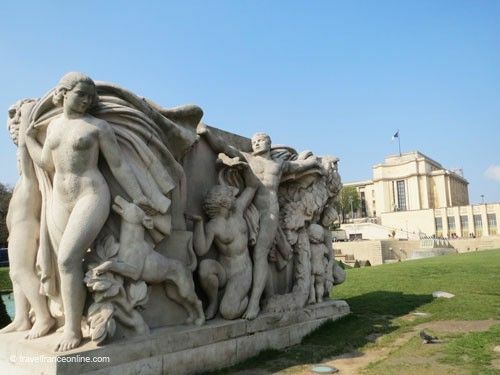 The landscape architect Roger-Henri Expert transformed the Jardins du Trocadéro in 1937. He retained the romantic twisty paths Alphand created in the lateral gardens for the Universal Exhibition of 1878 . However, he replaced the original central fountain with the Fontaine de Varsovie - Warsaw Fountain. This fountain is highly representative of the monumental architecture of the inter war. Eight basins (fed by 56 water cannons) flow into each other in the manner of a cascade. The effect is quite spectacular! A series of gilded bronze and stone sculptures embellish the gardens and the lateral slopes. You'll find a dog and two horse heads by the sculptor Pierre Guyot, and a deer and a bull's head by Paul Jouve. The rhinoceros and elephant statues, which date from Alphand's original garden, were transferred to the Orsay Museum esplanade in 1986. Two sculptural groups, La Joie de vivre by Léon Driveir and La Jeunesse by Pierre-Marie Poisson, adorn the fountain's main basin. Finally, you'll find many benches scattered here and there; you might want to take a break as you walk up the slope and enjoy the many decorative features and the view of the Eiffel Tower. The Jardins du Trocadéro are permanently open to the public.